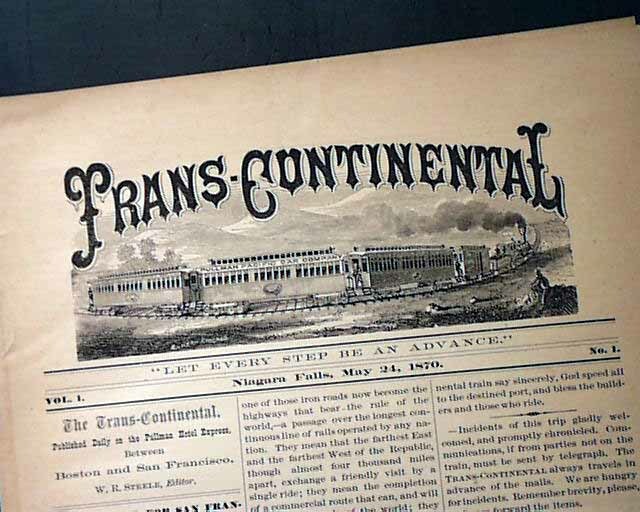 This is a very fascinating newspaper, borne in the ingenious mind of a publisher who decided to take a small printing press on board the first transcontinental railroad excursion and publish 6 issues westbound and 6 issues eastbound. 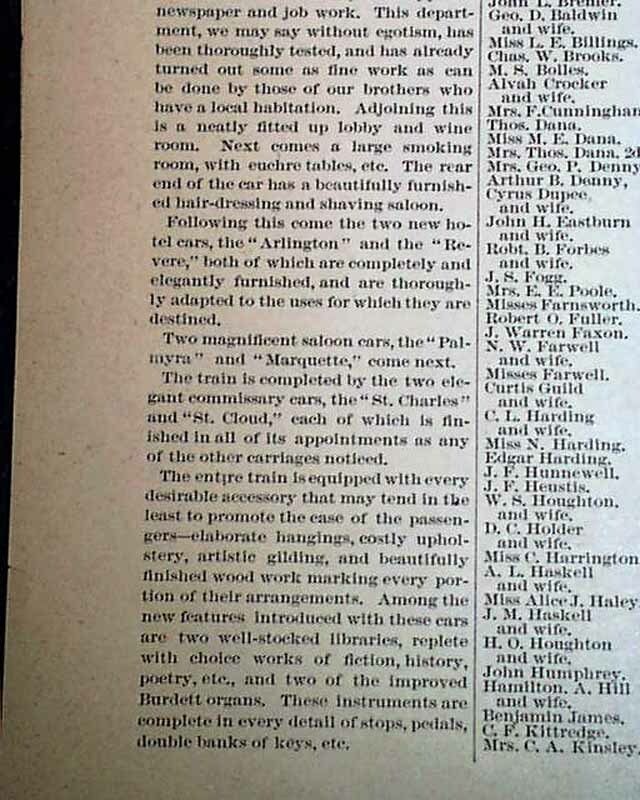 Printed on a Gordon press in the baggage car, it is considered the very first newspaper composed, printed, & published on a train. 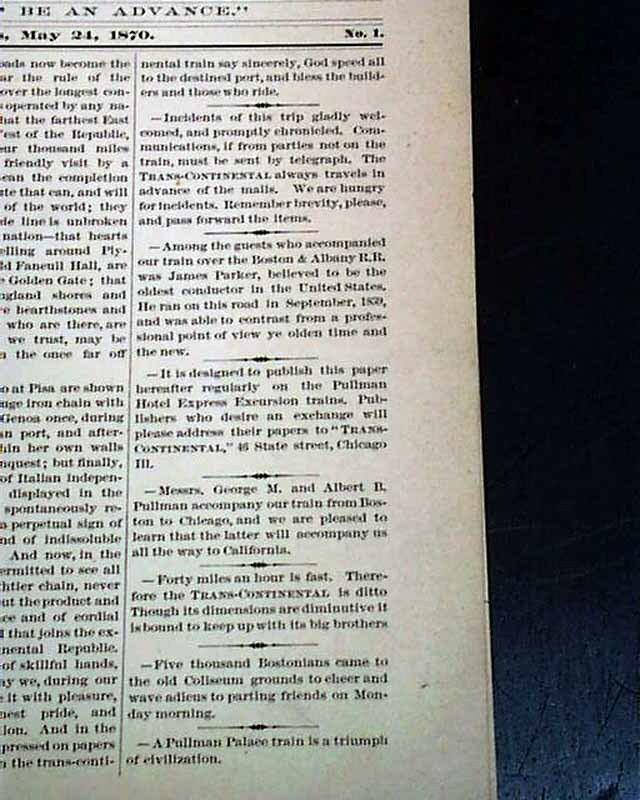 This is the very first issue, volume 1 number 1, published shortly after it left Boston, this dateline noting Niagara Falls. Each issue recorded the process of the journey with the sights and events along the way. Each issue carries the dateline of a different city: Niagara Falls, Omaha, Cheyenne, Ogden, Utah; Salt Lake City, Utah; Summit Sierra Nevadas, San Francisco, Promontory Point, Utah; Laramie, Wyoming, Grand Island Nebraska, Burlington, Iowa; and Boston. 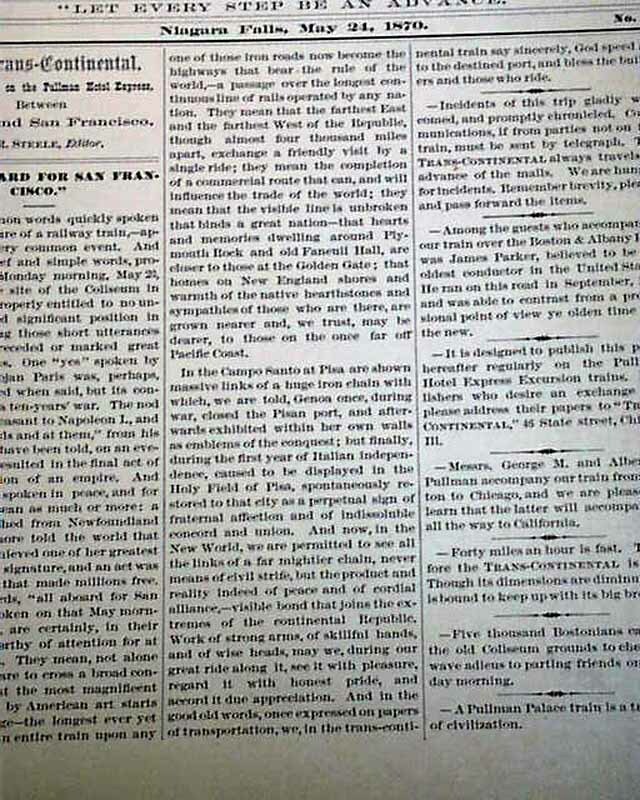 The front page has: "All Aboard For San Francisco" with fine content on the significance of this trip, noting in part:"...the farthest East and the farthest West of the Republic, though almost four thousand miles apart, exchange a friendly visit by a single ride; they mean the completion of a commercial route that can, and will influence the trade of the world; they mean that the visible line is unbroken that binds a great nation..." with much more. 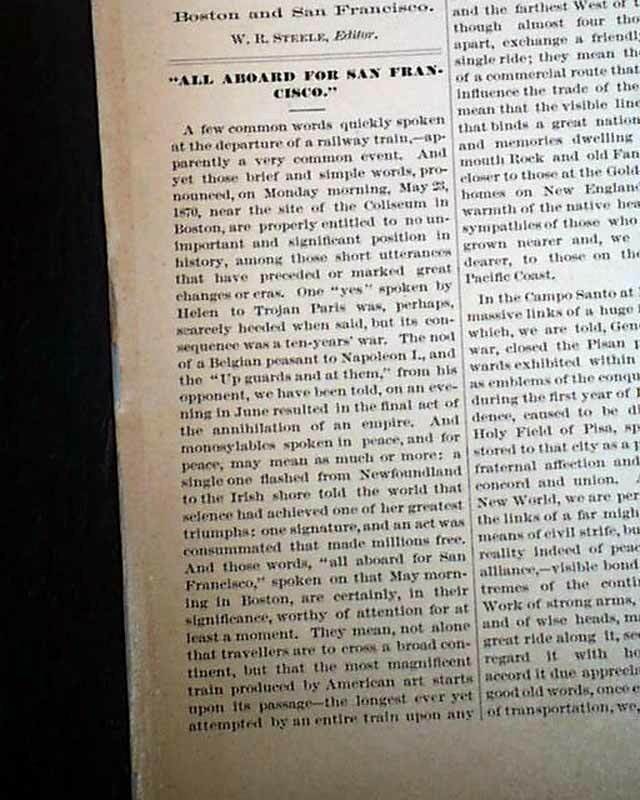 Other tidbits concerning the publication of this small newspaper. 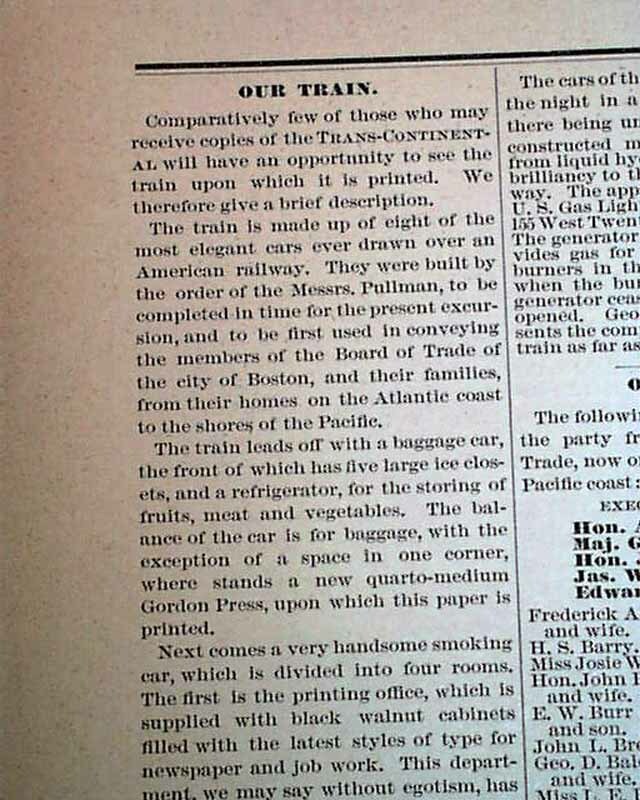 The back page has: "Our Train" which begins: "Comparatively few of those who may receive copies of the Trans-Continental will have an opportunity to see the train upon which it is printed. We therefore give a brief description..." with much more. 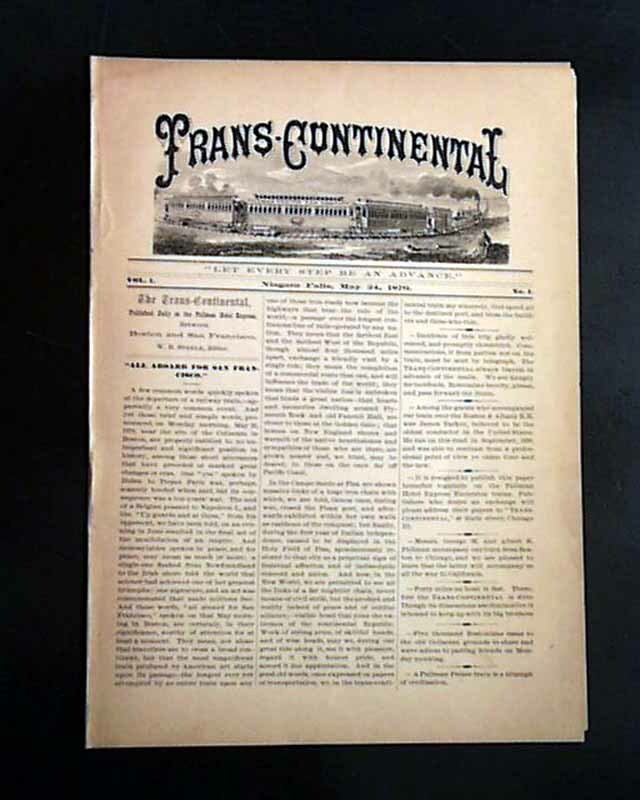 Four pages, great masthead, 7 by 9 3/4 inches, very nice, clean condition. A discrete archival mend at the blank spine. A very rare opportunity for a fascinating & rare newspaper. 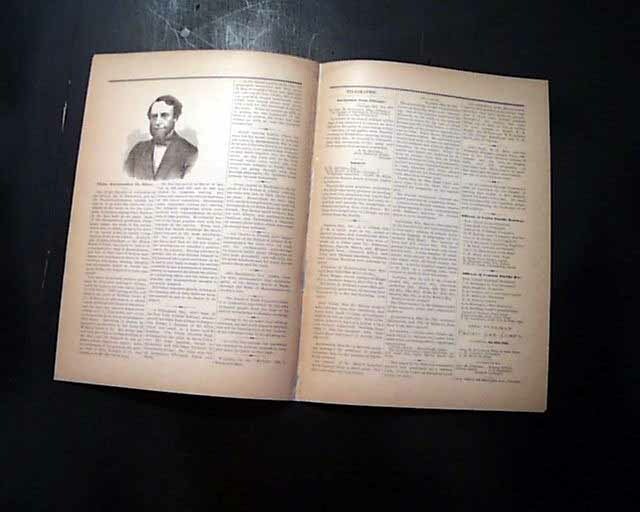 Included with this issue is a reprint set of all 12 issues published. See our item 615312 for details.